This granola is another great alternative to eggs for breakfast in the morning. I love it by itself just like a trail mix. Your family might find it hard not to grab a handful when they walk past the jar! 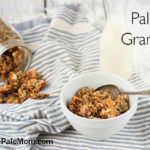 There are lots of different recipes for Paleo granola out there, but mine reflects the tastes of my family, none of whom like dried fruit in their granola. If you would like to add dried fruit to yours, just mix it in right when you pull the pan out of the oven, then let it cool it the pan. 1. Preheat oven to 300F. Line a large baking pan with parchment paper. 2. Mix coconut, nuts and seeds in a big bowl. Add cinnamon and nutmeg and stir to coat. 3. Melt coconut oil and honey on low heat on the stovetop or in the microwave. Add vanilla. 4. Pour coconut oil mixture over nuts and seeds. Stir to coat. Pour out onto prepared baking sheet and spread out evenly. 5. Bake for 30 minutes, until golden brown. Let cool completely in pan (for larger chunks), then pour into a plastic container or bag for storage. Extra tasty served with berries and milk alternative of your choice! Previous Post: « Is It Paleo? I think it would work. I keep mine in a mason jar in an 80F kitchen for weeks and it’s fine. Just made this. It’s 4 PM and I just can’t wait till breakfast tomorrow, so I won’t. It’s 7 AM somewhere. Love it! When are you supposed to add the coconut? Did not see it in the instructions and was not sure if the bake would burn it at all. With the nuts. I’ll edit the recipe to make sure it’s clear. I made this today and it tastes awesome. Thank you! Hello Sarah. for those who don’t tolerate Honey, would it be the same consistency with maple syrup ? Yes, I’ve actually made it with maple syrup before and it’s awesome! 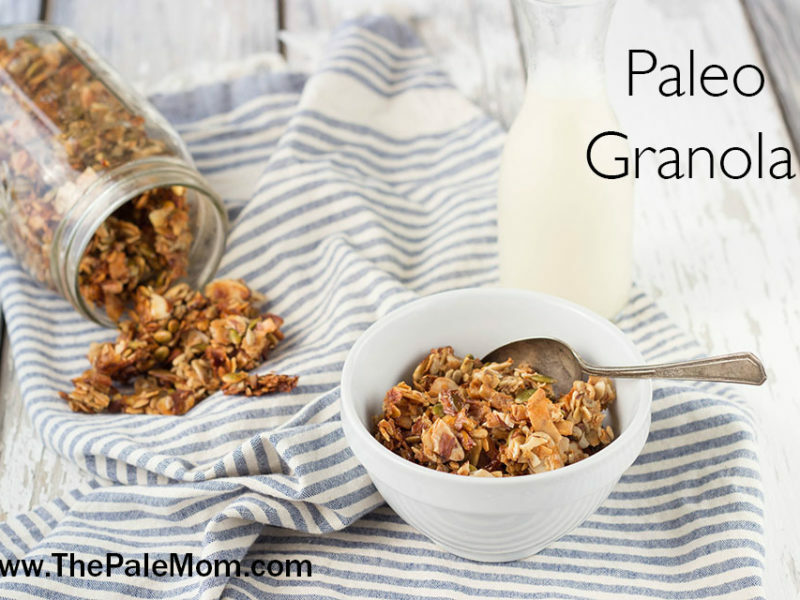 How much of the Paleo granola would you recommend for a breakfast serving? I’m in the process of going Paleo. I currently do not eat grains or legumes. Mainly eat and vegetables and small amount of fruit, and working on giving up dairy(which i eat a small amount of). I’m not a big fan of counting. I would recommend eating some beside a protein (like eggs or sausage) and just eating until you’re full. I’m making this for the second time as the first batch was gobbled up by co-workers. Thank you so much for this recipe and all of your recipes. I truly appreciate all the time you spend in creating such great food. Thank you for helping me make this Paleo journey a little easier (one month down so far). 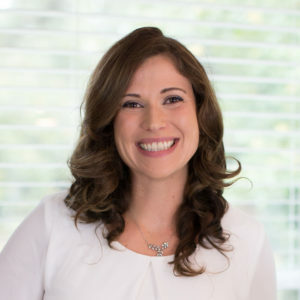 You’re an inspiration! How many servings do you normally get out of this? Depends on who is eating it and what else is for breakfast. It would be fairly typically to get 12 servings, but with an egg or two on the side. I substituted plantain chips (from the chips section of the health food store) for the coconut flakes since I can’t eat coconut. I put the chips in a food processor first until they were smaller sized pieces. It worked out great! Brilliant! I don’t love coconut chips and flakes and I’m forever wondering if I should leave it out of recipes and or what I could sub for it. Thanks! Doesn’t roasting take some of the goodness out of the raw ingredients? I would love to hear your response on this, as my toddler loves granola but I want him to get as much out of it as possible! Have you ever made this nut-free? Any suggestions on what could be used instead? Thanks! I am making this for a second time with substitutions since I don’t have a type of nut or two and shredded coconut because no one has flaked right now. Everyone loves it, even my 18 year old who tends to stay away from granola. It will become a favorite goto recipe. I’m allergic to nuts (leave out). I have an autoimmune illness also. Does that mean no pepitas to? I’m hypoglycemic, so dried fruit would have to be limited to 2 TBSP a serving. This is so difficult, but thanks for your many ideas and positive attitude. I generally recommend no nuts or seeds for autoimmune patients (check out my autoimmune protocol page for more info). 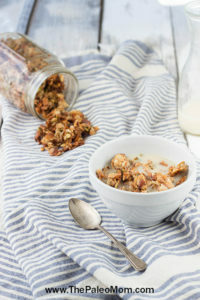 I have made a delicious version of this granola. 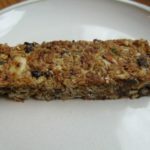 I am finding that nuts bother me and some seeds, so I made this with what appear to be the least troublesome and best nuts and seeds….coconut flakes, chopped macadamia nuts, walnuts, chia and flax seeds. I used pumpkin pie spice and maple syrup. It is very yummy with coconut kefir or coconut kefir yogurt and a few raspberries sprinkled on top. For my son I used the basic recipe, but used almonds, pecans and hazelnuts, plus the seeds and some chia seeds He loved the original version! Thanks for these great recipes. 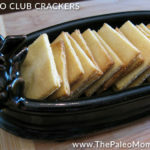 I love Paleo no-grain-ola… I make a raw version that I “cook” in my dehydrator. 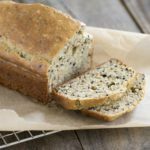 The only problem I can see with it is that it does tend to make me very “lazy” when it comes to breakfasts – it is quicker to give the kids some of this with coconut or almond milk, especially on days that I work…. and then they get loads of nuts, seeds and omega 6’s and not so much of the good stuff. I am planning on having a week off making the granola because of this…. 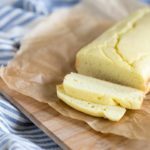 Is the coconut oil rendered or with flavor? I always use the one with flavor, but you could use either in this recipe. I was thinking of adding some raisins… do you think they would cook okay, or should I just toss them in after? Also, have you ever made it with some sea salt, for a sweet / salty granola? If you have, how much salt? I would toss them after while it’s still warm. I bet adding some quality salt would be awesome. I’ve never tried, but I think 1/4-1/2 tsp would probably be a good place to start. Just made this today…my house smells wonderful! Can’t wait for the kids to try it! Thankyou thankyou thankyou for all your divine recipes. This is lovely and smelt divine whilst cooking! Hy husband is the only one in the house (out of myself and 4 kids) that likes coconut or anything coconut flavored. Do they make coconut oil that has no remnants of coconut flavor? Also, is it possible to leave the coconut flakes out of this recipe? We’re new to Paleo so any tips would be greatly appreciated! Thank you so much! OMG! This recipe is AMAZING!! I made it tonight and had it for supper it was so delicious. I can hardly wait to spring out of bed tomorrow just so I can have some more. FINALLY. 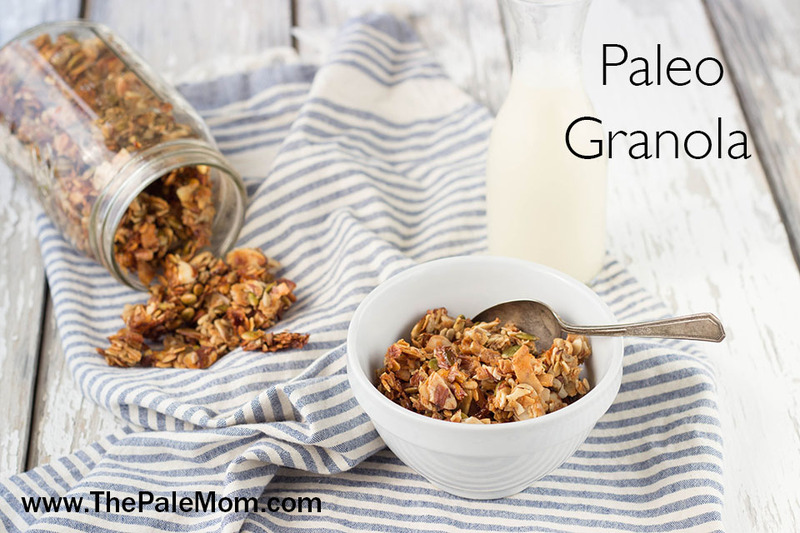 A granola recipe that is yummy, GF, Paleo, and non-mushy. THANK YOU!!! PS I just found your site today. So many granola recipes are loaded with sweeteners. 1/4 cup honey isn’t too bad! 🙂 Do you think if I soaked the nuts overnight it would change the texture too much? My daughter, who doesn’t eat Paleo , stopped by and wanted a snack. I gave her a small bowl of the granola. She couldn’t stop eating it and asked where I bought it. I told her I made it and she said she wished they sold granola that good in the stores! You may want to consider marketing this! So apparently no store in a 50 mile radius sells raw sunflower or raw shelled pepitas. Is it okay if they are roasted and salted? All I could find that was even close was David’s brand roasted and salted pepitas and some shelled sunflower seeds that had also been roasted. This is so yummy!! Love it! Thank you for sharing it!!! I added some orange extract and improved this recipe. Tastes like a Tootsie Roll. Sorry, meant to place the comment in the chocolate cut-out cookies recipe. Have made this a few times and is awesome! With this combination of nuts, reminds me of a homemade Kind bar. With that being said, would love to make these and cut them into bars. I have tried to do this twice now, but they don’t hold together at all. Any suggestions as to how to make the granola “hold” better? I followed the recipe exactly the first time, but added a little more honey and coconut oil the second time. Not sure if adding more helped hold together at all. Should I try cooking longer? Or different ratio of liquids? This “sounds” good – but I’m not sure why Paleo people dismiss grains but then eat so many nuts and seeds without soaking them? This recipe would tear my stomach to pieces! -Just something to think about. I just made the granola bars today. They were just a little dry, maybe overbaked? But all in all, very yummy! I will try them again, maybe cut them a little larger?